This book explains how search engines operate and the ways that can help increase the ranking of search engine results. You will learn the fundamentals of how search engines create indexes that are used to rank web pages and how they value inbound links, content relevance and metadata valuation. This figure shows how search engine optimization page ranking can be influenced by various factors. These include the number keywords in the web page (keyword density), number of links from related web sties (inbound links), the type and amount of content on the web page and how well the keywords match the search criteria. Kyle Sutton is an Internet marketing expert who specializes in search marketing. Since 2002 he has specialized in the design, analysis, and implementation of search engine optimization campaigns. Mr. Sutton specializes in the design and management of search campaigns, both paid and organic, and has been involved in all aspects of search engine optimization including key phrase research, analytics reports, ranking and traffic reports. He is a sought after professional who has consulted for a number of Fortune 500 companies. As an Internet marketing analyst Mr. Sutton has worked extensively with landing page optimization with a core focus on conversion rate amplification. Campaign-level improvements he has implemented include ad copy, key phrase research, implementation of negative keywords, and bid adjustments. 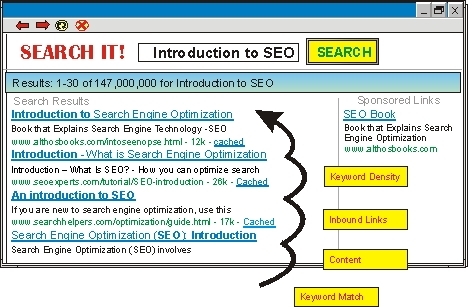 Mr. Sutton is the co-author of the book �Search Engine Optimization� and he is an editor for iMarketing Magazine. Discover that there are different types of search engine optimization objectives including increasing overall web traffic, increasing qualified web traffic, increasing search engine raking value, and decreasing visitor acquisition. There are different methods to achieve SEO objectives and some of them involve tradeoffs. You will learn why inbound links from popular web sites are important and ways to get links from these sites. Learn how search engines may reduce value or penalize for attempting to trick them using link farms, hidden keywords and redundant content. The penalties can rang from reduction in ranking to the elimination of listings from search results (negative blacklisting). How to find and select the right keywords is described along with the importance of placing them in key positions such as in the title, headings and close to the top of the content area. The different types of metadata tags such as titles tags, description tags, keyword tags, and robot tags are explained along with their importance and what text you should include in them. Included are design tips to help make your web site and pages search engine friendly. Learn how search engines can use navigation menus to index pages in your web site and effective ways and discover how to make your site search engine friendly while allowing the use of rich media menus and images. Discover how content is becoming more important to search engines and how to find or create content that the search engines like. You will learn about tools that you can use to determine if your web page and content is search engine friendly.